In the heart of Davao del Norte lies a river-cruising destination which aside from being a one-of-a-kind tourist adventure is also crucial in showcasing efforts in mangrove rehabilitation and fish production restoration. The seat of the provincial government, Tagum City hosts such river-cruising adventure on the Liboganon River which stretches 8.8 kilometers from the national highway to the Davao Gulf. It traverses barangays Liboganon and Bincungan. When sailing through the river, you will surely marvel at how its waters glisten under the sun. Mangroves sway with the blow of Northeastern Monsoon (hanging Amihan) while the surrounding air provides revitalizing freshness. Liboganon River is actually a tidal creek where sea water from Davao Gulf flows in during high tide and ebbs during low tide. As a sea-water catchment, Liboganon River serves as a feeding ground of deep sea creatures. Sea turtles, blue crabs, shellfish, squids and sharks have found their way into it seeking food, and even spawning at its wilds of mangroves. Its 30-meter average width provides enough space for river cruising, for hook-and-line fishing as well as for fish caging. It can as well accommodate traps for fish, crabs and prawns along its banks. While cruising Liboganaon river the sight of the boating adventures of fisher-folk children skillfully maneuvering through the river using their paddles is also fascinating, aside from live community fishing activities. Such sights bring moments of closeness with fisher-folks whose lives at the waters are less seen, therefore less understood. Making their presence felt and their voices heard, fishing residents of Liboganon have bound themselves together into Liboganon Fisherfolk Association (LIFA). LIFA men extend river-cruising services as boat-rowers. They may at times, have their boats rented for river-cruising adventure, while LIFA women accommodate tourists as guides. They also sell souvenir items and serve visitors with native delicacies especially during river adventures of large delegations. Not only does river-cruising in Liboganon bring visitors close to fisher-folks, but it communes them with nature. The mangroves that border its riverbanks appear like eye-refreshing green curtains. 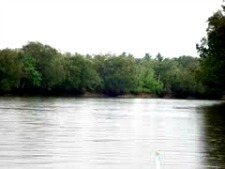 Some 95,000 hills of Bakhawan mangrove species have been planted since six years ago. They are growing alongside with centuries-old mangroves, providing cool shade for river-cruisers, home for birds, and spawning ground for marine fish, crabs and prawns. These activities began when the city government of Tagum passed in 2007 the Fisheries Code of Tagum. City Agriculturist George Grandia said Tagum City Mayor Rey T. Uy led in January 2008 the clearing of Liboganon River from 380 fishing structures that obstructed the water-flow and drained so much of its marine resources. After clearing Liboganon River, the city government then waged massive reforestation of its riverbanks and started planting mangroves. It prohibited the use of fine mesh nets and allowed only hook-and-line, traps for crabs and prawns, and fish cages. “It became dead for sometime. Fish-catch was almost nil,” Grandia said. “But now, it is easy for them to catch two kilos of fish in an hour,” Grandia said referring to fisher-folks who now find Liboganon River as a vital source of food. Later, it embarked on promoting Liboganon River as a river-cruising destination, tapping the private sector to provide the ancillary services such as bookings and food catering. It also brought in the participation of the Council of Women of Liboganon to support the eco-tourism venture. The city government through its City Agriculturist Office is working closely with the Bureau of Fisheries and Aquatic Resources (BFAR) to sustain efforts on environmental protection and fish production restoration.